Input Protection Optional Input circuit breaker provided protection to the unit, load and personnel. Input Circuit Breaker may be higher interruption rated up to 65 KAIC. Output Protection Internal Electronic overload protection. 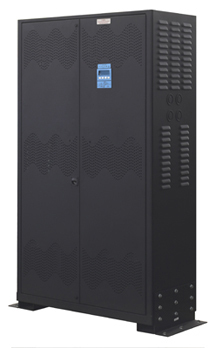 Circuit breaker provides inherent over-load protection. Factory selectable voltage 120, 208, 240, 277 or 480 for input or output voltages. If input is different from output or output different from input, an internally mounted transformer is required. Surge Protection The inverter will protect itself and the load against surge as defined in ANSI/IEEE C62.45 category A and B. Isolation Output is completely isolated from input, and with multi voltages, when input & output is different. Safety Agencies OSHPD OSH-0499-10, CSA Listed to UL924, UL924A, & UL1778, NFPA, NEC, OSHA.